The giant oarfish (Regalecus glesne) is a rare and strange customer indeed. The oarfish is assumed to live in deepwater in the mesopelagic zone between 200 and 1000 meters. Its resemblance to the giant moray eel is only superficial, because it has no teeth but gill rakers meant to catch tiny organisms and filter out plankton. It also has wide round eyes, a reflective silver body covered with black dots and a long pinkish dorsal fin starting between its eyes to the tip of its tail. The fin rays are soft and may number up to 400 or more. At the head of the fish, the rays are lengthened forming a distinctive red crest. The oarfish derives its name from the long paddle-like appendages sprouting downwards from the head. The stories of sea serpents may in fact be accounted for by sightings by fishermen of the giant oarfish with its undulating way of swimming when it came near the near the surface. Despite its large size the oarfish is not a very strong swimmer. It moves through the water undulating its large body with the dorsal fin as a means of propulsion while the body axis is held straight and stable, called amiiform locomotion. The long antenna shaped tendrils and ’oars’ that protrude from the gills may be used to sense for orientation and keeping balance. Its flesh seems to be rather untasty, the reason why they are unwanted bycatch of fishermen that occasionally find a specimen in their nets. 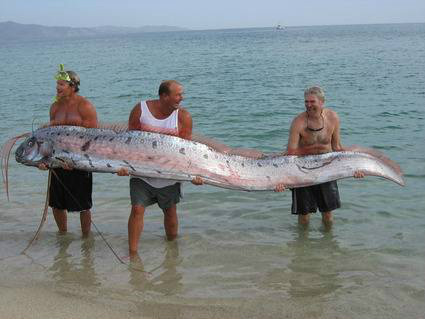 Most sightings of the oarfish are on land, when they wash up dead or dying on a beach and become a popular target for visitors and photographers (picture above). The reason why the oarfish strands so often remains a mystery. One possibility is that it is essentially a deep see dweller and a poor swimmer that lacks a swim bladder. It becomes helpless when it is caught by strong currents that push it to the continental shelf where it strands on a beach, or becomes battered to death on the rocks by larger swells. It may also become confused by the sudden changes in pressure when it enters more shallow waters. A curious finding is that the oarfish often seem to be missing a part of its tail. Since there are no bite marks, it could be a sign of autotomy, the ability to willingly cast off a body part like lizards do. With its vital organs concentrated towards the head end of the body, a loss of the tail would therefore not necessarily do the fish much harm.